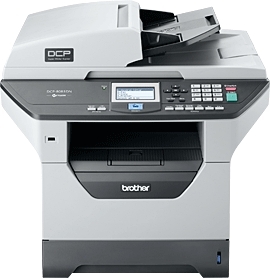 The DCP-8085DN produces high-quality monochrome laser output with fast print and copy speeds of up to 32ppm. It features full duplex capability with automatic two-sided print/copy/scan, built-in networking, a legal-size document glass and a 50-page capacity auto document feeder. It also offers an adjustable 250-sheet capacity paper tray and a 50-sheet capacity multi-purpose tray for printing custom paper sizes and letterhead. A USB Direct Interface allows you to print from or scan to your USB flash memory drive. Fast, high-quality copying and printing. Quickly copy and print documents at up to 32 pages per minute. Produce professional-looking documents at up to 1200 x 1200 dpi. Full automatic duplex (2-sided) capability. Copy or scan both sides of an original document to either print or store the scan as two single-sided pages or as a single two-sided page. Or, you can copy or scan two single-sided documents and produce a copy or store a scan as a single two-sided page. Convenient USB Direct Interface. Print PDF or JPEG files from or scan PDF or JPEG files to your USB flash memory drive. Large, expandable paper capacity. Features an adjustable, 250-sheet capacity paper tray for up to legal size paper, and 50-sheet capacity multi-purpose tray for printing custom paper sizes. An optional 2nd 250-sheet paper tray is also available to increase your total paper capacity to 550 sheets. 50-page capacity auto document feeder. A quick and easy way to copy or scan multi-page documents. Flexibility connectivity. Offers an Ethernet network interface for sharing on your network and Hi-Speed USB 2.0 and Parallel interfaces for local connectivity. Multi-copying. Make up to 99 copies at a time and even sort them into groups. Reduce/enlarge copies. Original documents can be reduced or enlarged from 25 400% in 1% increments.